Little compares to the comfort of a warm baked potato right out of the oven. 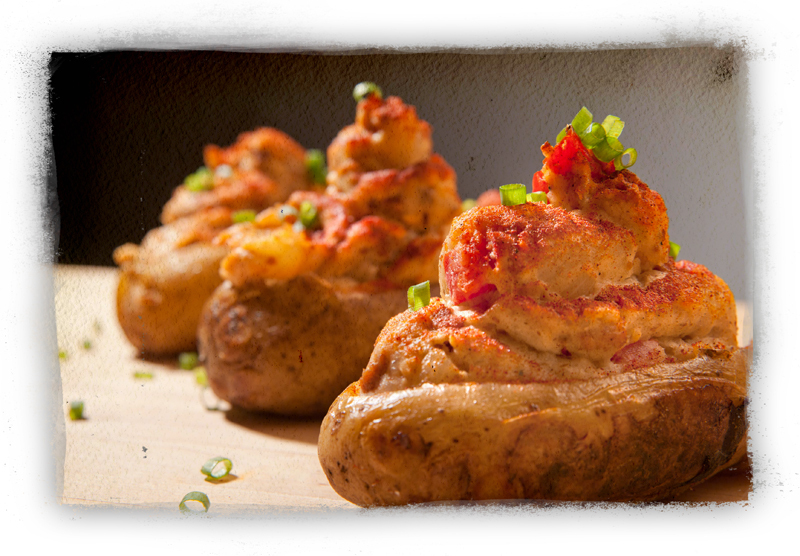 Except perhaps a warm baked potato, twice-stuffed with creamy, chili-spiked mashed potatoes and Feisty Beyond Meat! The secret to making this recipe awesome is the extra potato – you’ll use it to add to the filling and make the other spuds really over-stuffed and decadent. Sometimes vegan food is health food. 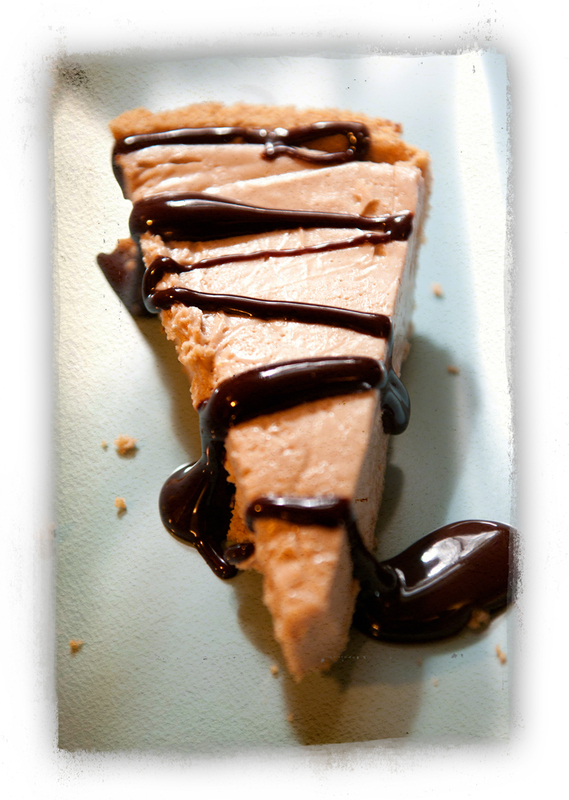 On this occasion, vegan food is indulgent and home-style! So dig in – this is a perfect dish to eat while watching the next football game, at a dinner for two or when sharing with family. Want to kick up the chili factor? Add a few dashes of your favorite hot sauce, some beans or diced jalapenos to the stuffing! You can also make them ahead and warm the entire batch up just before serving. Set oven to 375. Rub potatoes with oil and pierce with a fork several times. Bake on a baking sheet for 1.5 hours, until insides are hot, soft, and thoroughly cooked – and skins are crispy and browned. While potatoes are baking, sauteed diced onion, garlic, Beyond Meat Crumbles and red pepper flakes with a dash of olive oil in a large pan over medium-high heat. When onions are wilted, turn off heat and move the mixture to a large bowl. Set aside. After potatoes are baked, allow to cool to room temperature, or at least until you can touch them comfortably. Using a sharp knife, slice a V-shaped wedge into the top of five potatoes. Being careful not to tear the skins, scoop out the insides of the first five potatoes and add to the mixing bowl with onions/garlic/Beyond Meat/red pepper flakes. Discard the sliced-off tops of the potato “V” once you have scraped away the insides. The sixth potato is xetra – and it will make the twice-stuffed goodness brim over the tops of the remaining five. For this final potato, cut in half and sc0op out all the insides. 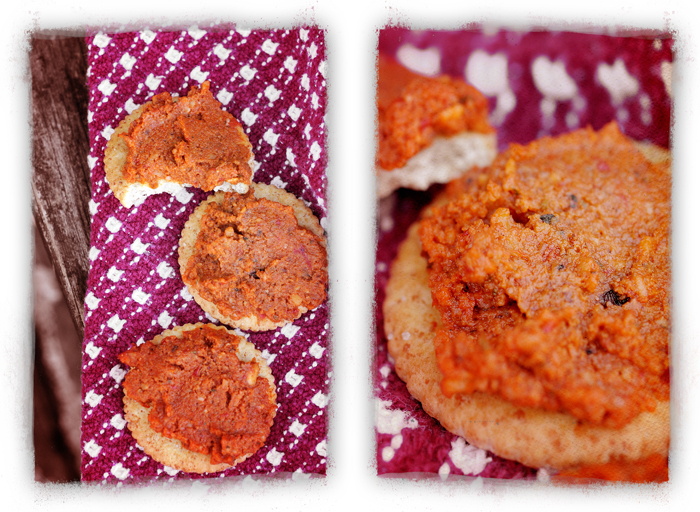 Discard skins (or eat them as a snack – we usually do). Add to the mixing bowl chili powder, vegan cheddar shreds, vegan sour cream, vegan margarine, dairy-free milk and salt & pepper. Smash together, as if you are making mashed potatoes. You can do this by hand with a sturdy fork or a potato masher, or use a hand mixer to make them extra smooth, whatever you prefer for your mashers. When the ingredients are well combined and all the sour cream/margarine has melted into the potatoes, fold in the chopped tomatoes by hand. Stuff the five potato shells with the mashed potato filling until the tops are heaping. They should be over-stuffed. Sprinkle with paprika, if desired and return to baking sheet. Bake an additional 15-20 minutes, until heated through. Serve warm with green onions scattered on top. Help your best pal cool off by treating him or her to some chilly yumminess, like these frozen Carob Banana Pup-Pops. 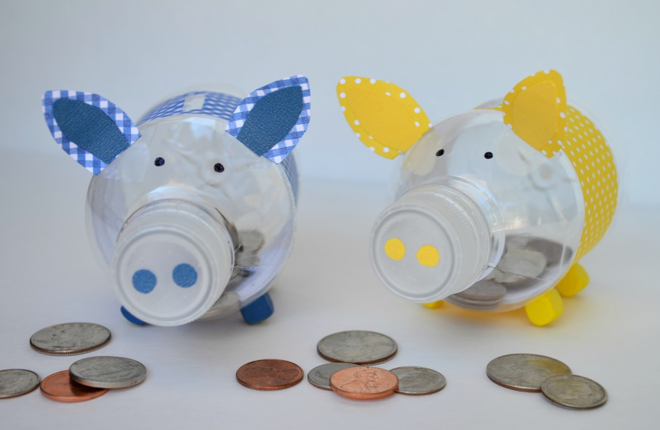 They’re simple to make and a fun project to include kids on. Your dog will love them too – our ex-racing greyhound, Lochrima, goes gag for them! First she licks the carob and peanut shell off, then munches on the chilly banana center. You should be be able to pick up a bag of carob chips pretty easily, we find them in the natural foods area of our local grocers. If not, a store like Whole Foods will certainly have them, and there’s always Amazon.com. 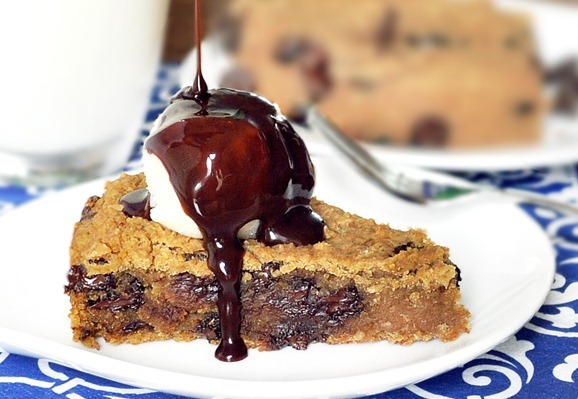 It is **CRUCIAL** you use carob and NOT chocolate for this recipe! Chocolate is toxic to dogs! Want a list of other foods to watch out for? 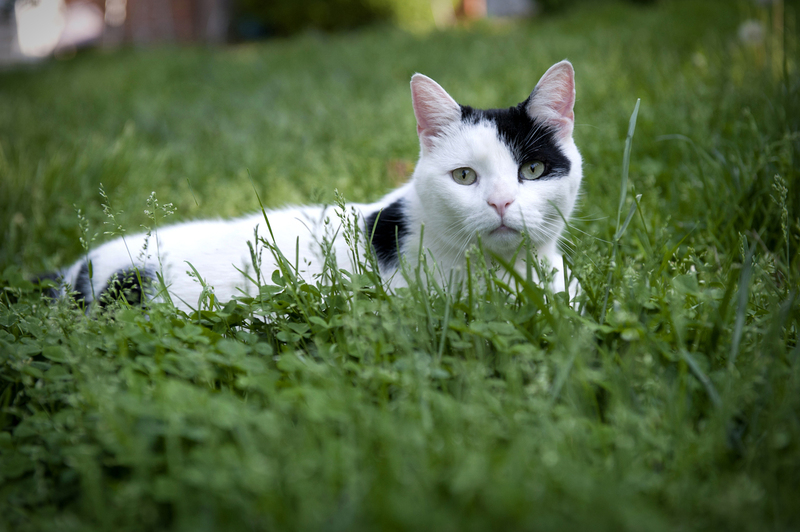 Try this page from the ASPCA. If you are allergic to peanuts, try using almond butter and almonds or sunflower seed butter and sunflowers for this recipe. Just don’t substitute macadamia nuts – those are also toxic to dogs! Line a cookie sheet with parchment or wax paper. Place banana halves on sheet and freeze for several hours or overnight. To assemble, melt carob chips and peanut butter together in a double boiler over low heat on the stove. Stir often until smooth and silky. Place chopped peanuts in a low bowl, like a pie plate. Dip the frozen bananas into melted carob/peanut butter, then quickly roll in chopped nuts. Place back onto lined cookie sheet. Repeat with other banana halves. Place back into freezer until carob is set, about one hour. 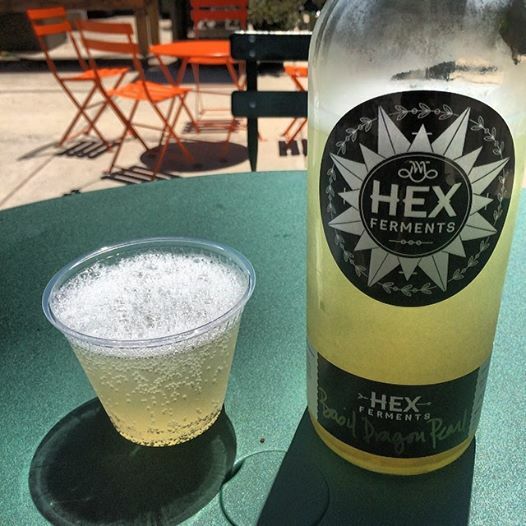 Serve cold on a hot day! Want more love for your dogs? We want to send you more love for your dogs! 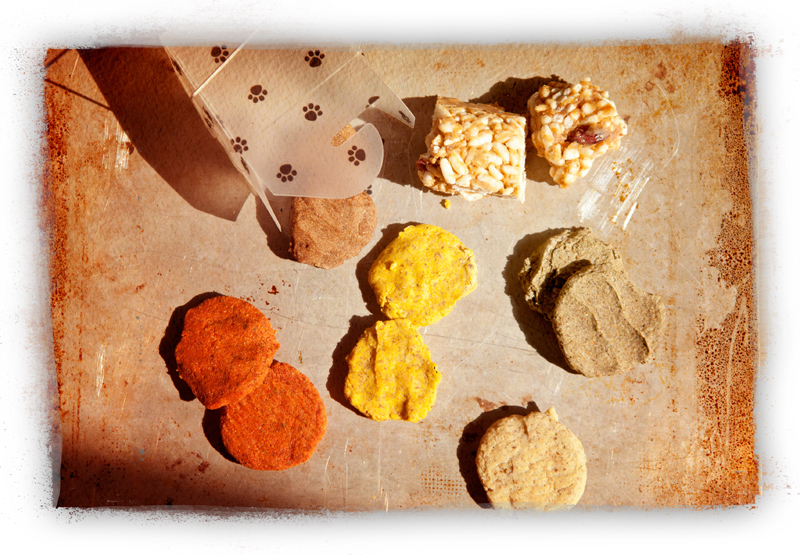 If you like baking, we’ve got SIX more recipes for you and your canine companion. It’s true that baking isn’t as fun in the heat. We don’t have central air, so these fans really don’t cut it when the oven is on in summer. The answer? Bake in the early morning or after dark in the evening. Or, go to a friends’ house who has central air! We use a lot of non-wheat flours in these cookies. Many experts feel they are easier on dogs’ tummies. To find these flours, check your grocery store’s natural foods or gluten-free sections. Again, Whole Foods and Amazon.com will have them. Occasionally, we get lucky and find bags of them super-cheap at places like Ross, Marshall’s and Big Lots. No joke! A bag of chickpea flour that’s $10 at Whole Foods cost us $2 at Big Lots. Big difference and worth checking for! Preheat oven to 375. Mix ground flax meal in water and set aside to congeal. In a food processor or blender (or by hand in a mixing bowl), combine flours, nutritional yeast, turmeric and olive oil. Add in flax mixture. If dough is too dry, add water until well combined and smooth. By hand, form into desired size cookies. Use cool water on your fingers to prevent sticking. Bake at 375 until browned on edges and firm, about 12 to 15 minutes, depending on the size of your cookies. Yield will vary based on cookies size. Preheat oven to 375. In a food processor or blender (or by hand in a mixing bowl), combine pumpkin, whole wheat flour, cinnamon, ginger, carob powder, molasses and olive oil. If dough is too dry, add water until smooth. By hand, form into desired size cookies. Use cool water on your fingers to prevent sticking. Bake at 375 until browned on edges and firm, about 10 to 12 minutes, depending on the size of your cookies. Yield will vary based on cookies size. Preheat oven to 375. Mix ground flax meal in water and set aside to congeal. In a large bowl, combine oats, peanut butter, ginger, almond milk and water. Add in flax mixture. 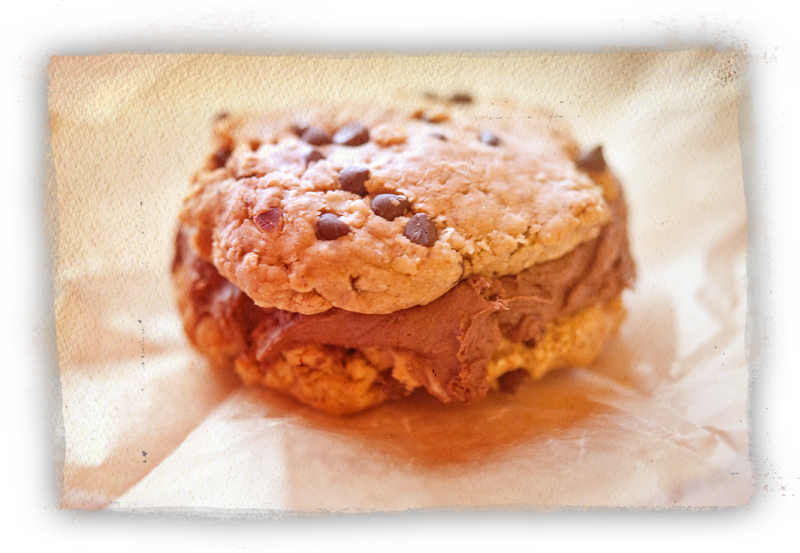 When well-mixed and moistened, fold in carob chips. By hand, form into desired size cookies. Use cool water on your fingers to prevent sticking. Bake at 375 until browned on edges and firm, about 15 to 20 minutes, depending on the size of your cookies. Yield will vary based on cookies size. Mix ground flax meal in water and set aside to congeal. In a large saucepan, combine peanut butter, brown rice syrup and vanilla. Stirring regularly, warm over low/medium heat until the mixture becomes liquid – about 2 to 4 minutes. Don’t overcook, or it will start to scorch. In a large bowl, pour melted peanut butter liquid over the rice cereal and cranberries. Add flax meal mixture. Stir everything together by hand. This will take some muscle. Spray a 9×13 casserole pan with non-stick spray. Press rice cereal/peanut butter mixture into pan firmly with your hands or a spatula. Chill at least one hour before cutting in serving-size portions. 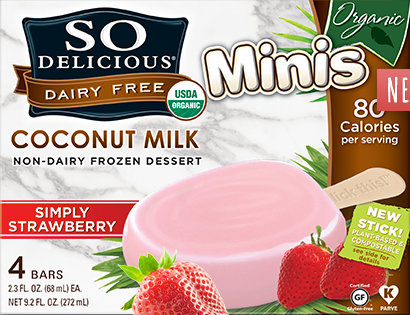 This is also a yummy people-snack, too! Preheat oven to 375. Mix ground flax meal in water and set aside to congeal. In a food processor or blender (or by hand in a bowl), mix brown rice flour, tomato paste, chopped parsley, basil, oregano and olive oil. Add in flax meal mixture. If dough is too dry, add 1/4 cup of water until well combined and smooth. By hand, form into desired size cookies. Use cool water on your fingers to prevent sticking. Bake at 375 until browned on edges and firm, about 12 to 15 minutes, depending on the size of your cookies. Yield will vary based on cookies size. Preheat oven to 375. Mix ground flax meal in water and set aside to congeal. In a food processor or blender chop carrots and kale to fine pieces. Add spirulina, buckwheat flour and water to processor; mix well. Add in flax mixture. If dough is too dry, add water until smooth. By hand, form into desired size cookies. Use cool water on your fingers to prevent sticking. Bake at 375 until browned on edges and firm, about 10 to 12 minutes, depending on the size of your cookies. Yield will vary based on cookies size. Vote for the BEST vegan stuff! Now is the time to exercise your right to be heard ~ on the topic of general vegan awesomeness, that is. 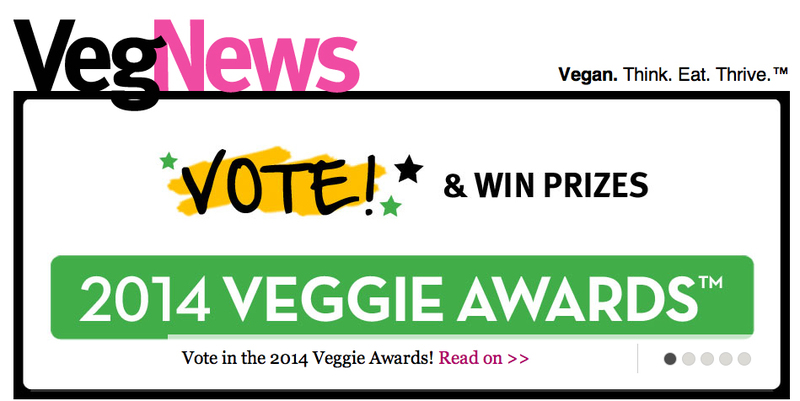 It’s the annual VegNews Veggie Awards and it’s your turn to make your opinion count for these small vegan businesses. 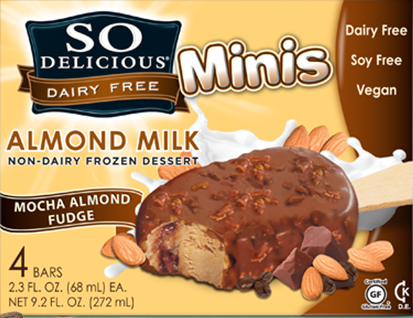 You can vote for best non-dairy milk, best chocolate bar, best vegan cheese, best vegan restaurant. 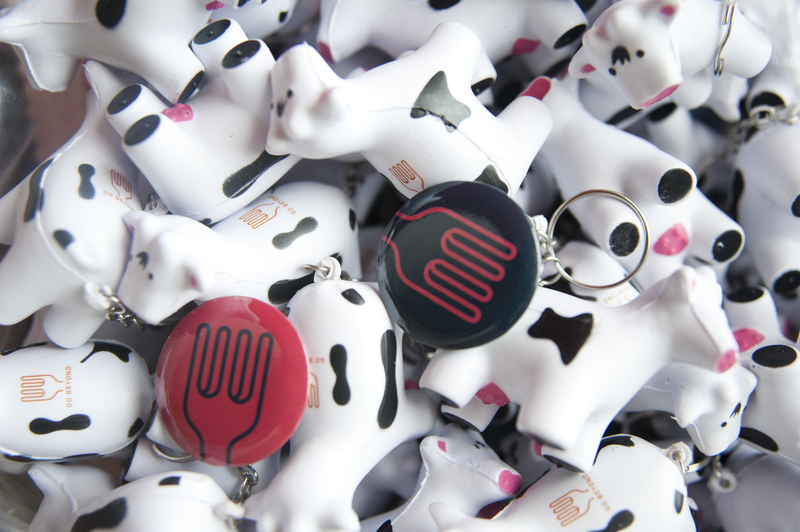 Then there are fun categories like fave veg celebrity and best fake “meat” – can we suggest Beyond Meat for your vote? For some small businesses, like the vegan B&B category, these votes are a huge deal to the success of their business! 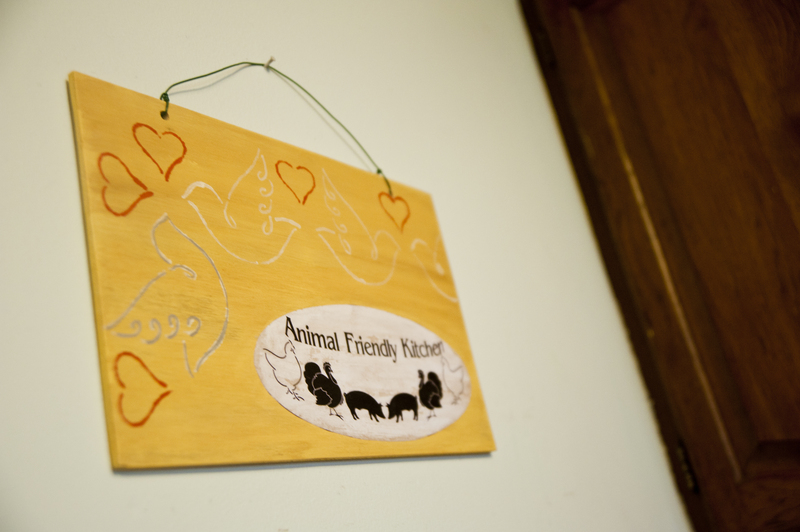 Don’t forget our friends, recently profiled, at the Ginger Cat B&B in New York. 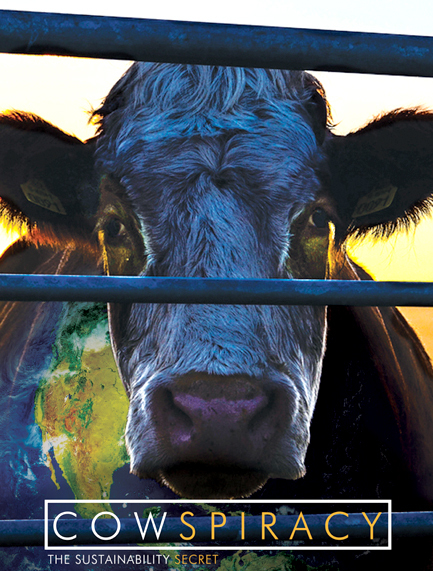 As you cast your vote remember – any support you give to vegan businesses helps them grow. All small businesses struggle, so make your votes count and ask others to get online and rally behind all these companies by participating in the VegNews Veggie Awards 2014! Click over to VegNews here and get going! Summer is winding down, but there’s still plenty of time for picnicking! 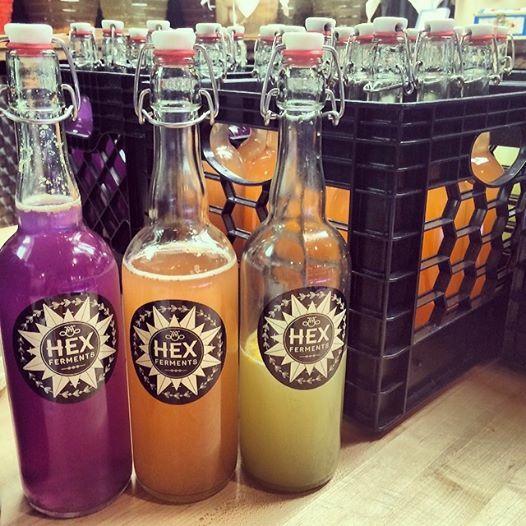 What to pack in your basket..? There are so many options. No need to settle for a tired container of hummus and some chips. Try one of our fun summer recipes. We’ve got a fiesty potato salad to rev things up, chickpeas and broccoli to fill your wrap, tofu BBQ with slaw, a gluten-free take on tabbouleh and a crunchy snack mix on the side. Throw a few cookies or some fruit into the basket as well, and you’re all set for a yummy day of outdoor eating! Ready for an update on the classic? 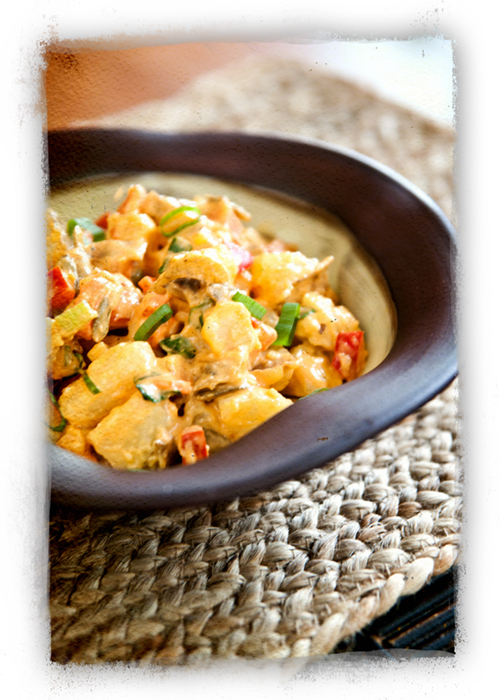 Try our Buffalo Potato Salad. We took the usual and amped it up a bit. There are still chunky of yummy potato and the traditional celery and carrot, but we’ve tossed in some buffalo sauce, white miso and pepitas to give this summertime staple a new life. Red pepper, green onions and spices round out the recipe. 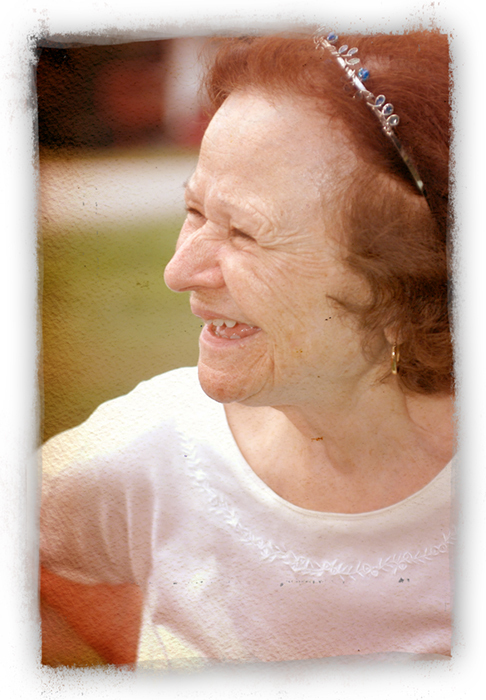 Click on over to Sister Eden’s blog to check it out. This is sure to please the fellows who go for buffalo-whatevers, as well as anyone who likes a fiery kick to their food. You may have noticed, we like it hot around here. Some people even say that spicy food keeps you cooler in summer heat. While I have no idea if that’s true or not (anyone? 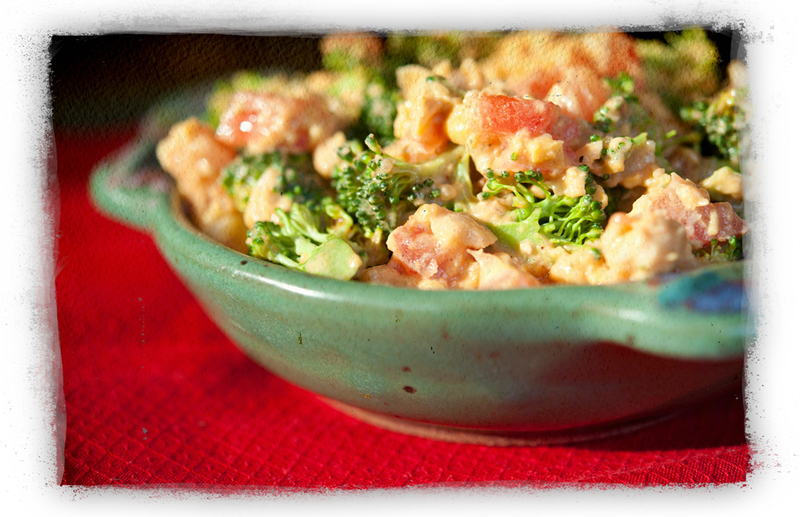 ), I can tell you for sure that this Spicy Broccoli Chickpea Salad is very tasty and makes great filling for a tortilla, pita, lettuce wrap or sandwich. Can’t stand the heat? No problemo. Just leave the hot sauce out. This recipe is versatile and you can still enjoy the garbanzo beans and veggies with just the plain dressing. 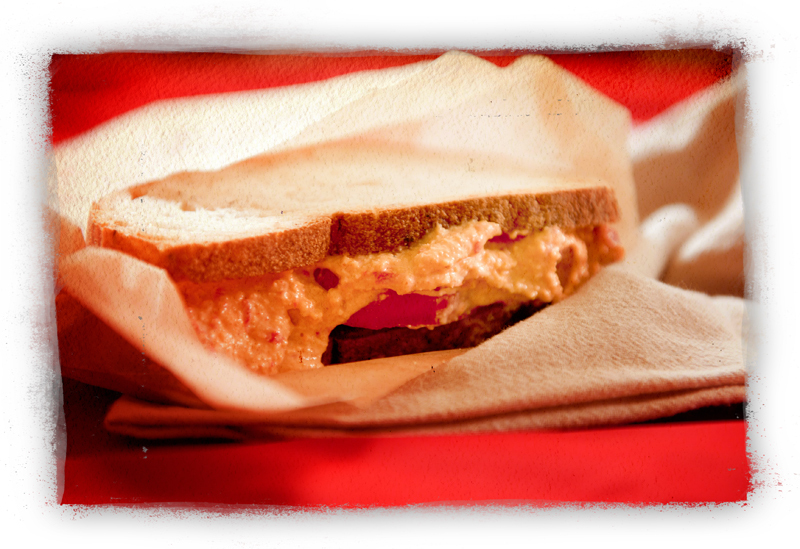 This recipe is also living on Sister Eden’s blog and is just a click away from joining your picnic basket! BBQ and slaw pretty much scream “summer food to eat outdoors.” In this recipe, the BBQ is warm with a spicy bite from cayenne and horseradish. The slaw cools things down with dill and crunchy cabbage. You can make both parts individually, or keep ’em together, and they are a tasty way to stuff a sandwich or wrap. Making the slaw ahead will really give the flavors a chance to combine. 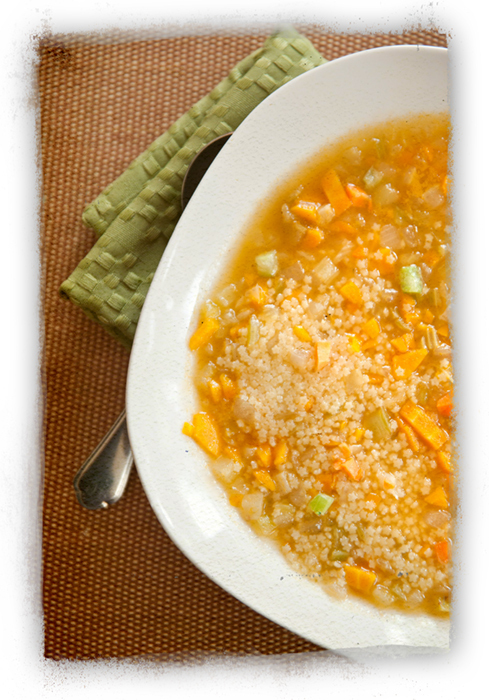 Sister Eden is keeping it real with this recipe – click on over to check it out . Everyone knows tabbouleh salad. 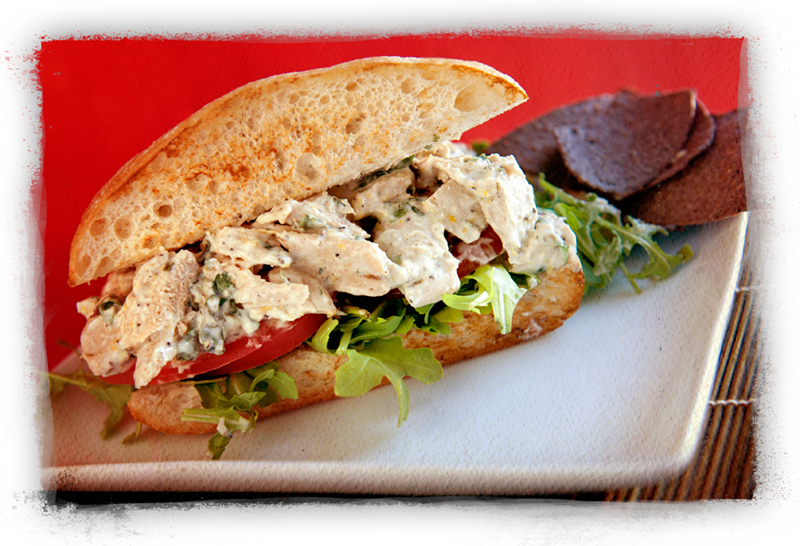 It’s bright, refreshing and a great side or even a sandwich filler. But traditional tabbouleh salad is made with wheat, so if you’re wheat or gluten free, you may be missing this scrumptious dish. No more. 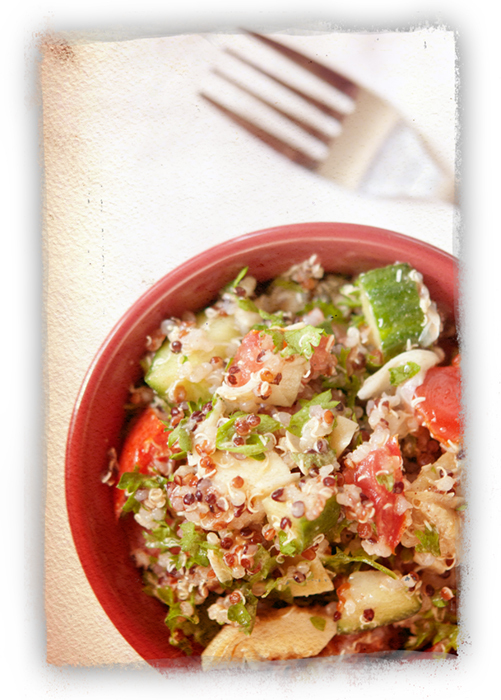 Try our redo made with quinoa. It has a similar texture and flavor profile. Pile on the tomatoes, cukes, parsley, mint, lemon and spices and it is just like you remember. We also added some surprises, like artichoke hearts, to really update this tasty salad. Check out the recipe with Sister Eden. Everyone knows how it feels to be munchie. 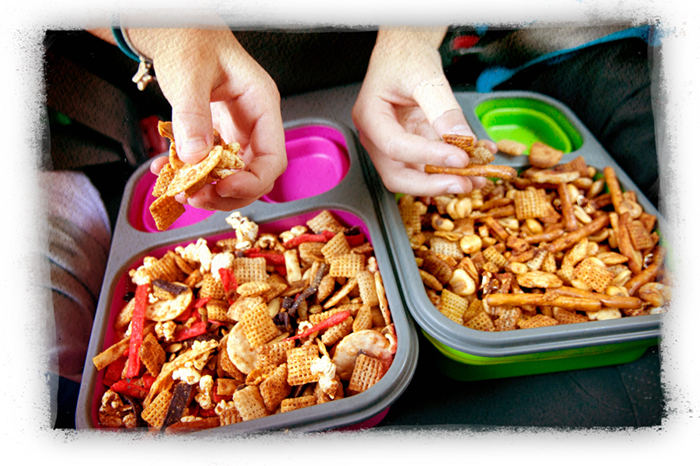 This snack mix duo is great as a side, or in the car or when you’re running around the campground/beach/amusement park/pincic area – where ever! We gave the old school square cereal mixes a vegan makeover with some more modern flavor profiles: Mexicali and “Bacon” BBQ. Be sure to make a double batch of whichever you decide on, cuz these will disappear quickly. We even tested them on picky young eaters – and both were a hit! This is easy to make gluten-free, as are both of the above salads, so the recipes are safe for GF eaters, too. 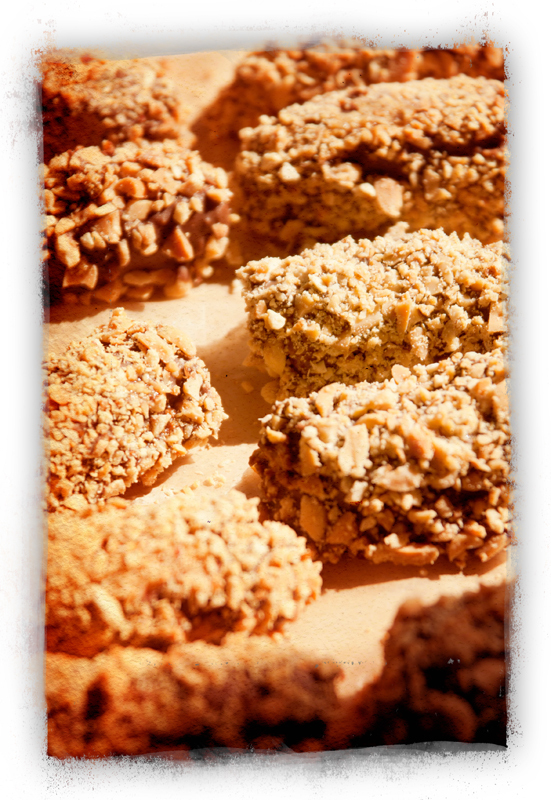 Get your Munchie Mix on by viewing the recipes on Sister Eden’s post. So are you ready to head outdoors for a picnic? You’ve got potato salad, chickpea wraps and snack mix ready to go. Want more tasty picnic ideas? Check out these posts from the past…. one or more is sure to please your picnicking crew! See you outside! Farm Sanctuary. When you say the words, it’s rock solid. 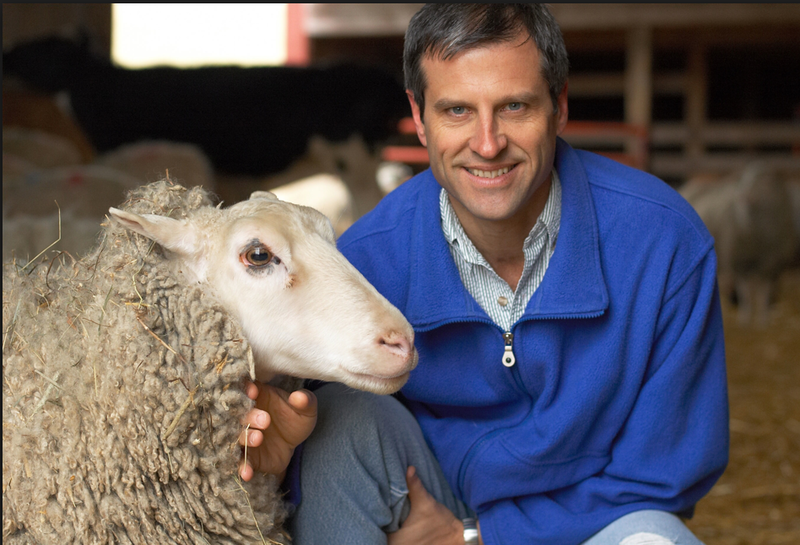 It’s the baseline and standard for farmed animal rescues everywhere, thanks to Gene Baur and an army of dedicated volunteers. 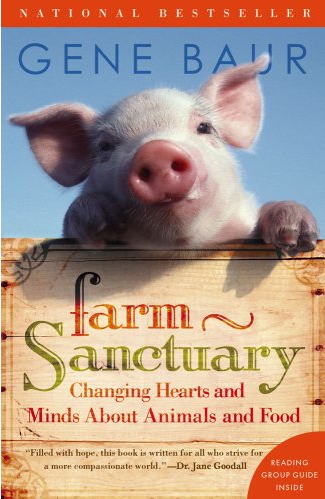 Founded in 1986, Farm Sanctuary is the largest animal rescue in North America. There are three locations, one in New York State and two in California. 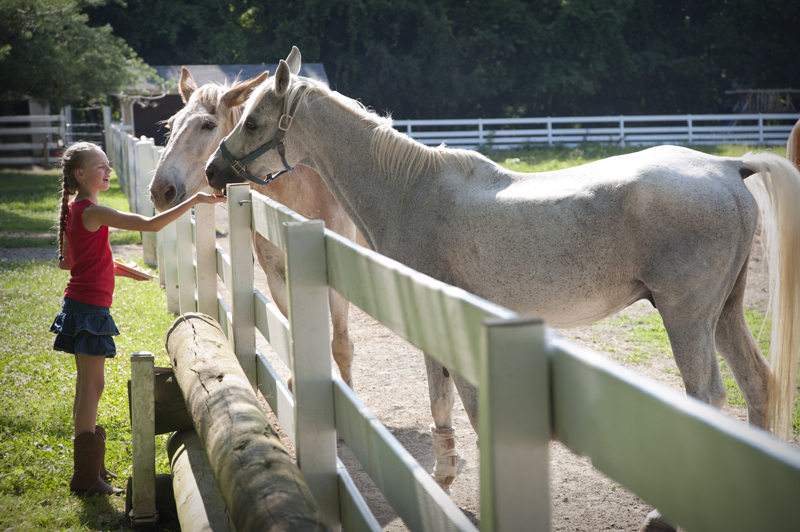 Our journey starts at the east coast farm, just outside of Watkins Glen, New York. Yep, it’s our first video/photo combo on this blog! We’ve visited Farm Sanctuary three times, and all the images on this post are from a past visit, not when we went last week. 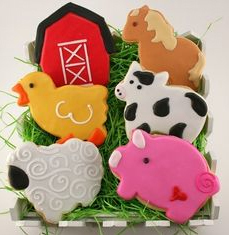 But it looks the same – the rolling fields, the cheerful red barns and the perfectly happy critters. 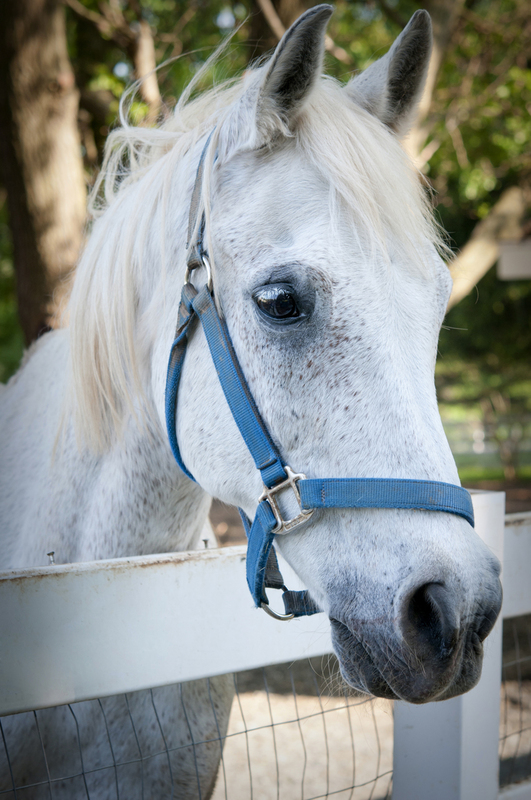 Just before you arrive at the NY Farm Sanctuary, you wonder if you’ve taken a wrong turn. You find yourself winding back an unpaved road. Yes, there are signs… but still, you don’t think it could possibly be the place. And just when you are about to give up and call the visitor center, there is a break in the forest and you see the lush green pastures and bright barns. You’re there! Inside the People’s Barn you’ll find a number of displays about the residents of the sanctuary, as well as a real battery cage, veal crate and gestation crate. There’s also a large gift shop with clothes, books, food and drink, as well as toys and goodies for children. In the gift shop, you also pick up your ticket for the tour. On this visit, we had a super tour guide named Ben. He was well-spoken and great at answering tough questions. 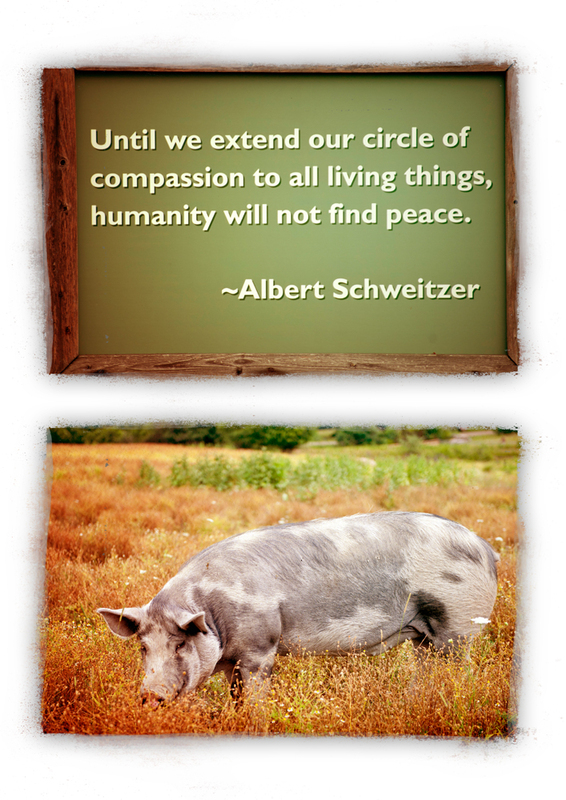 Maybe we are naive, but thought only vegans, vegetarians and animal-lovers would visit a place like Farm Sanctuary. On our tour there was a cattle farmer, and he was set on arguing almost every point Ben made. Lucky for the animals, Ben was not rattled and had calm, factual answers for each comment made. We were impressed. The first stop on our tour was a cow pasture. It was the closest I had been to a cow until that point, and their calm, gentle nature was a beautiful thing to witness. There are about 50 cattle living at the New York farm currently. Ben told us that cows can live to 25 or 30 years old, but most are killed by age 4 when they are in the factory farm system as beef or dairy cows. That day, we met cows named Kirsty, Sammuel, Meg, Frankie and Thunder. 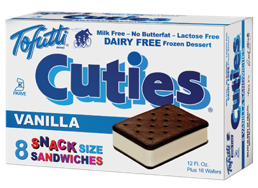 Each was a sweetheart. No one wants to admit they play favorites. But let’s be honest – there’s always a favorite. And for me, the favorite is goats. I’m not sure I can explain why. Is it their wiley nature, the joker-esque smiles, the ability to eat anything, the way they climb? Maybe all of the above. Maybe I was a goat in a past life. Who knows. 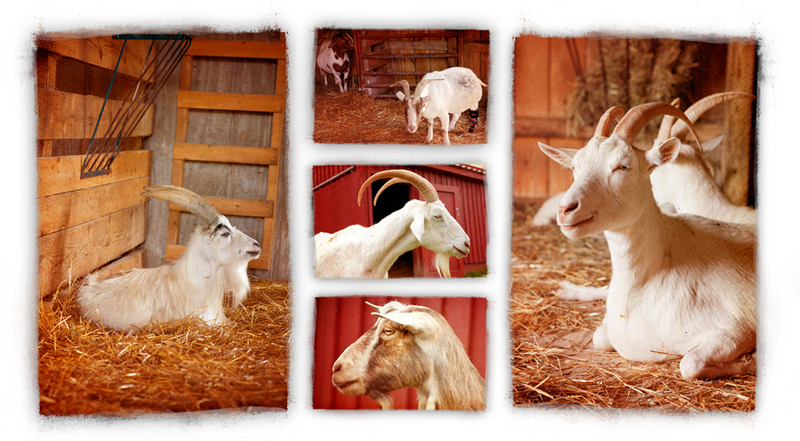 But I just adore goats, and the goats at Farm Sanctuary were no exception. 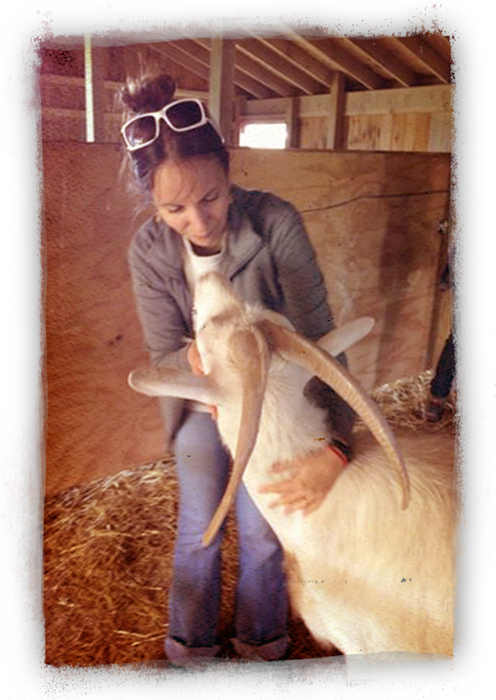 Yes, that is me, snuggling a goat. 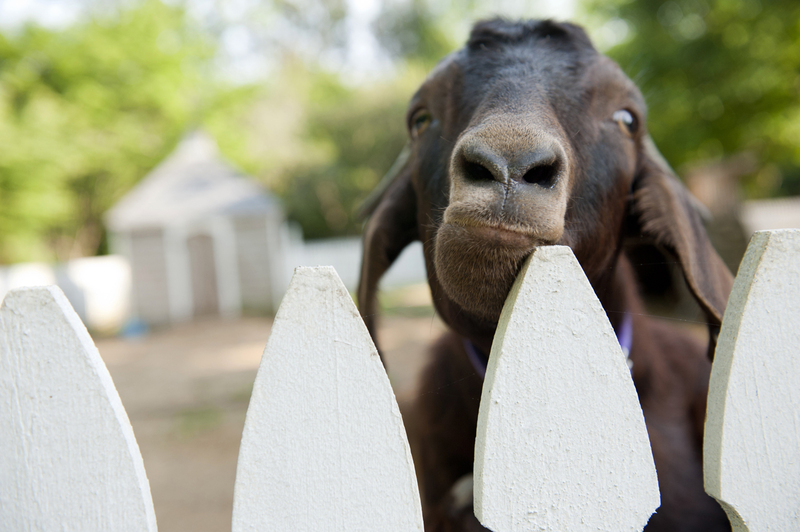 A large number of goats make their home at the New York farm. 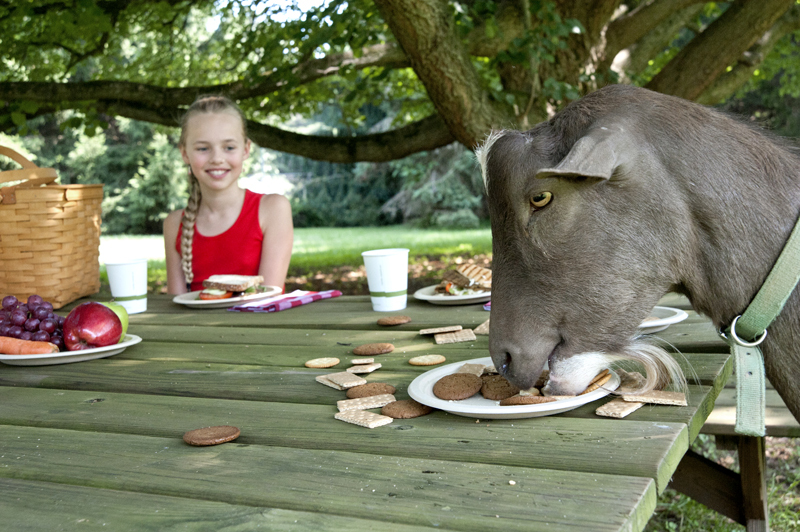 Many were dairy goats. Others were rescued from live markets, where people go to select the living animal they wish to have slaughtered for a meal. Ben explained that though many Americans don’t think of goats as usual meat, that they are used heavily for goat cheese, which has gained popularity and are commonly eaten in many ethnic cuisines, such as Jamaican and Middle Eastern. Next we met some chicks. There were loads of ’em, walking all around. Ben told us that of the 9 billion animals killed for food in US annually, 8 billion are chickens and the average chicken in the food-system has a 42 day life span. Considering that chickens can live to be 7 to ten years old, that’s pretty shocking. Of that number of chickens, many millions are male baby chicks in the egg industry. They have no use and many are tossed – alive – in trash bags and dumpsters, or worse – ground up while still alive and made into feed for other animals. The chickens and roosters at Farm Sanctuary got lucky. They are living their lives out in peace. 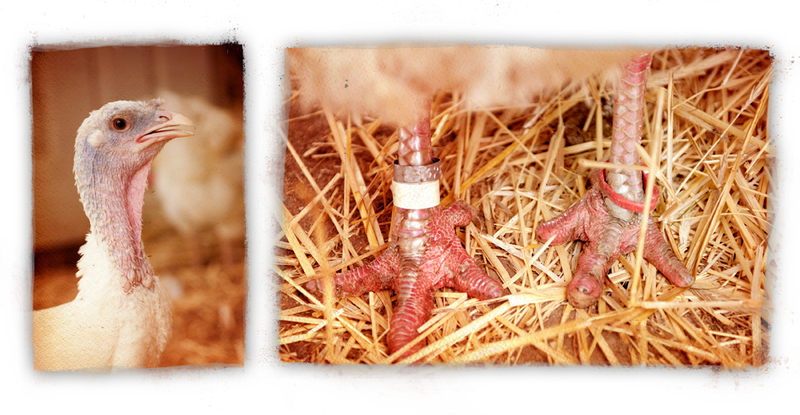 They get to truly free range, they can scratch at the Earth, run and play and roost. You can see by their beautiful feathers and bright eyes that they are healthy and serene. Though we’ve both seen plenty of wild turkeys (for serious, not the kind on the liquor bottle label), Farm Sanctuary was the first place we met turkeys rescued from the factory farm system. As you can see, the Dirty Hippie took a particular liking to Antionette. Tour guide Ben explained that turkeys bred for food are always all white (wild turkeys are colorful or brown), because it’s considered more appetizing for consumers if there is no pigment in their skin. Also, factory farms trim off turkeys’ beaks and toes, because when in confinement, they become stressed and peak/scratch at each other. 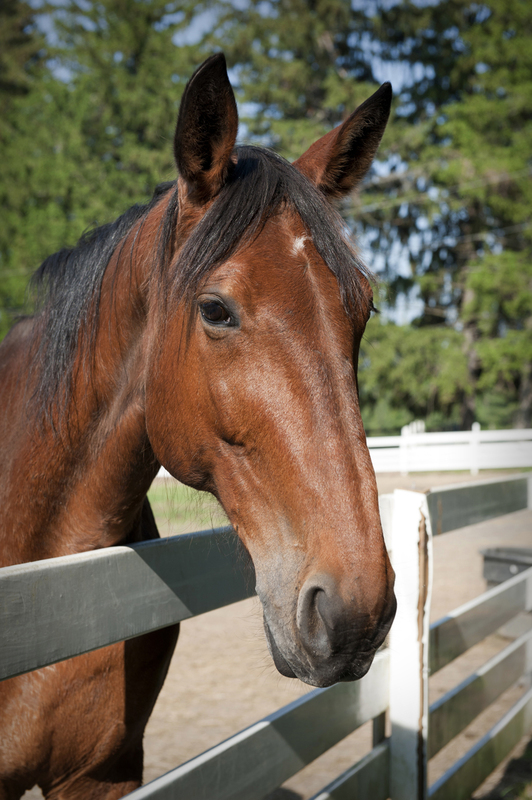 This is common practice and is done with no pain killer or follow-up vet treatment. Basically, imagine someone cutting off your toenails and the first bones of your toes, as well as the tip of your nose – with no pain killers. These mutilations have been found to shorten the lives of turkeys and are quite painful, as both the beaks and toes have nerve endings. And yet, the rescued turkeys we met – despite the fact they were treated terribly by humans before – were friendly and happy to see the folks on the tour. Many walked up and wanted to be fed and petted. 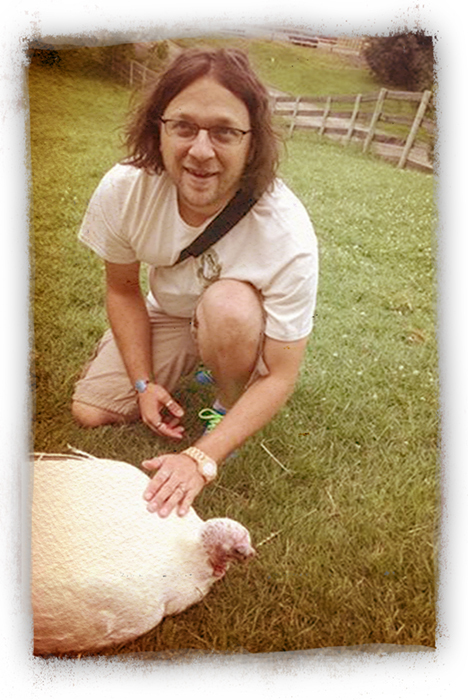 We were amazed at the turkeys’ general feeling of trust towards everyone in our group. It was encouraging to witness their contentment and know they were in safe place, where they were well cared for and loved. The last stop we made on the New York Farm Sanctuary tour was a pig barn. And what a way to go out with a bang! These critters were fun, funny and super outgoing. Several wanted belly rubs and just laid right down to wait for the massage to begin. 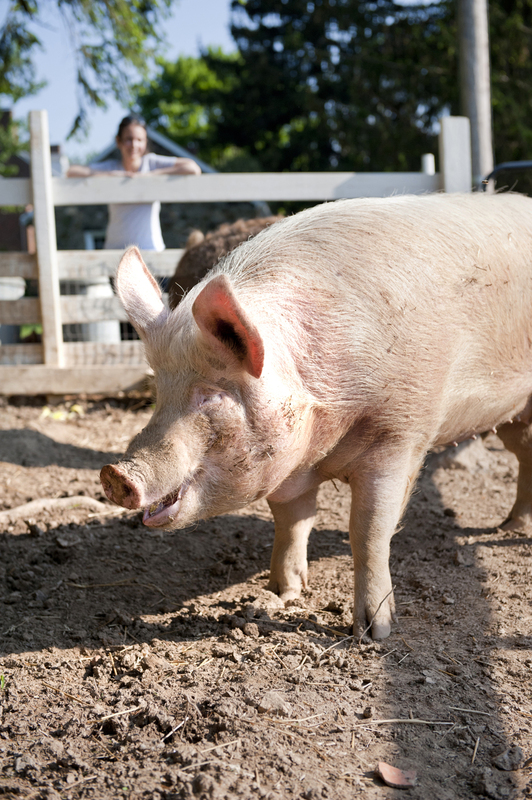 Ben explained that pigs aren’t really dirty, like people always say. 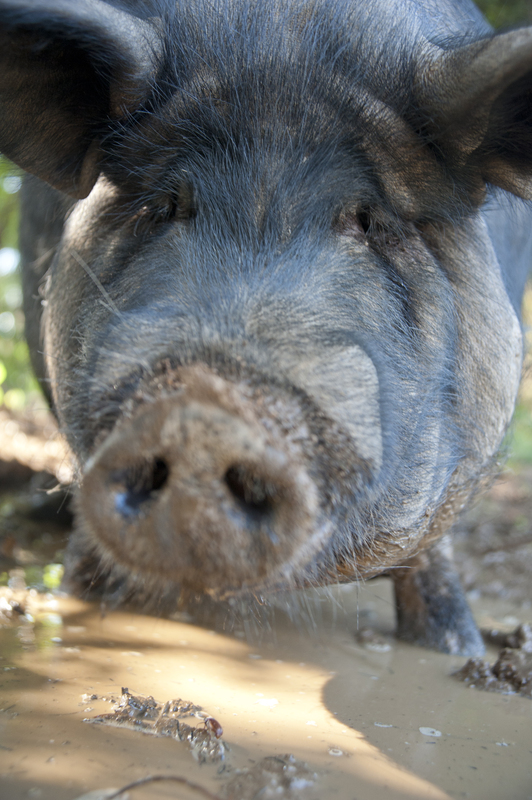 Pigs mud-bathe to keep cool in the summer heat, as they don’t sweat. 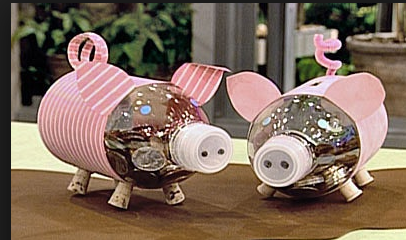 Also, pigs can get sunburned, so the coating of mud can protect them from an uncomfortable scorch. While it’s well known that pigs are highly intelligent, we learned that they are smarter than dogs, and can perform better playing video games that young human children. This is barely a scratch into the surface of the facility at Farm Sanctuary. There were also sheep pastures and barns, areas with rabbits, and a large enclosure with ducks and geese, that also included a pond. A lovely garden is planted as well, around the grave of Hilda. 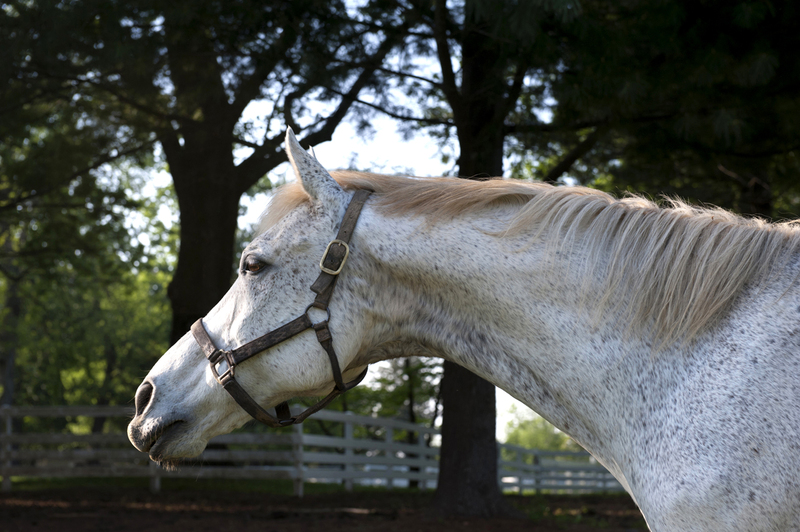 She was the first rescue made by Gene Baur: he was at a stockyard in Lancaster PA and saw a sheep on the dead pile that was still moving. 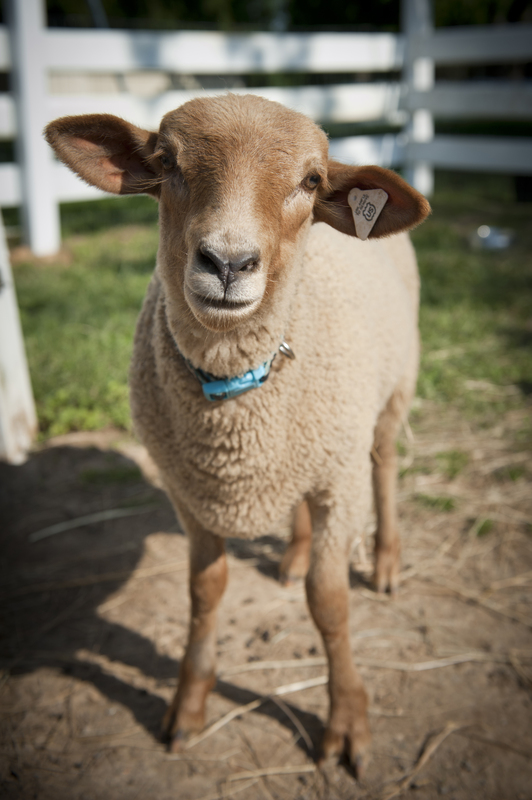 With his companions, Baur picked her up and took her to a vet, assuming she would need to be put down, but with some simple fluids, Hilda the sheep was revived and perfectly healthy. 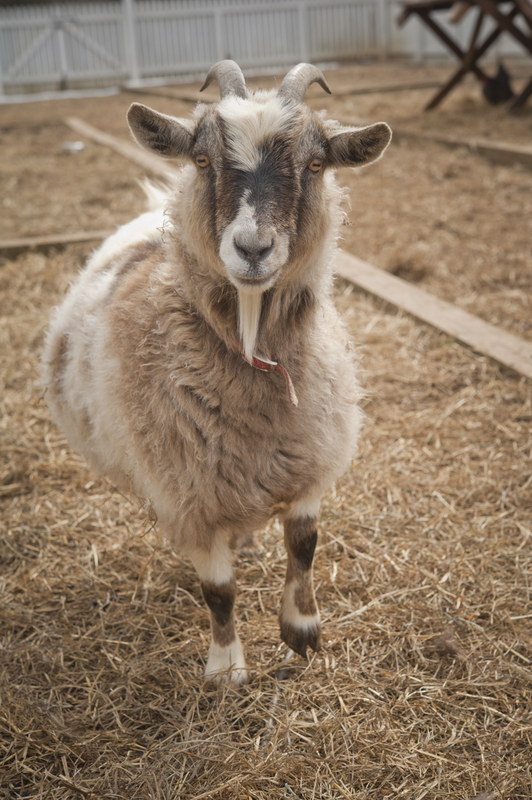 Hilda lived with Baur on Farm Sanctuary for 11 years until she passed of old age. Her grave is a tranquil place, well-tended with flowers and a stone marker. Clearly Hilda knew love and was blessed to have Baur pull her from the stockyard all those years ago. When she lifted her head towards him, she inspired a chain of actions that has since saved the lives of thousands more animals – both by actual rescue and by inciting other people to stop consuming animals. And – Want to know something incredible? Gene Baur got this whole thing going by selling veggie hot dogs from a van. No joke. What that means to me is – that if you set your mind to doing something good in this world, and you keep at it, amazing things are possible. Look at the smile on that pig’s face. I think what she’s saying is something like… thank you. 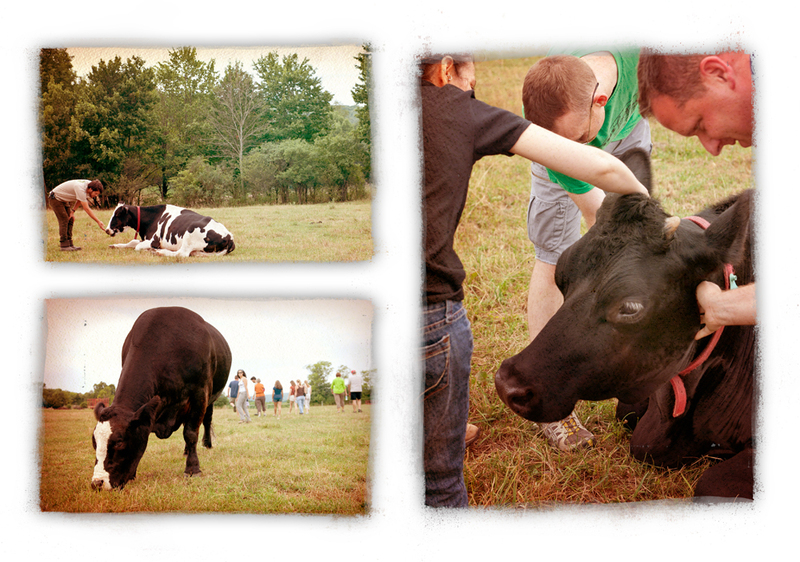 To visit Farm Sanctuary in New York, plan your trip between May and October. Tours are not given over the winter. Be sure to check their hours and available tour times online. 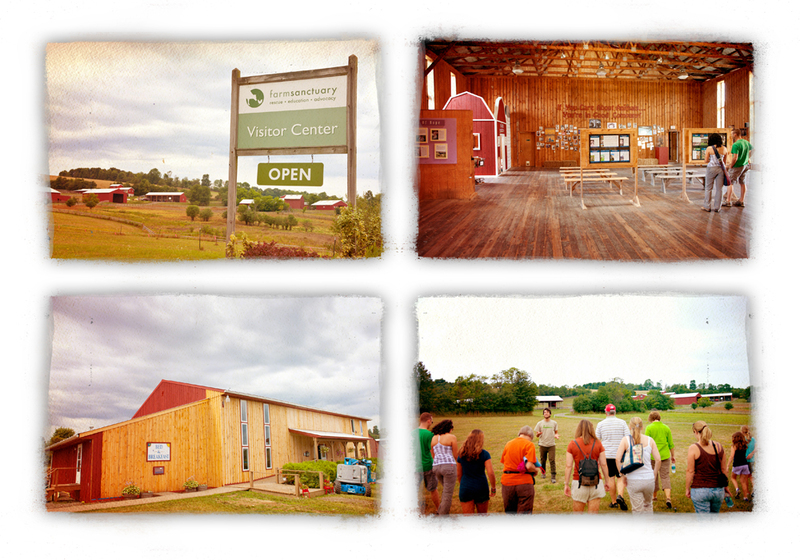 The farm is located at 3150 Aikens Rd., Watkins Glen, NY 14891. Their number for tour info is 607-583-2225. 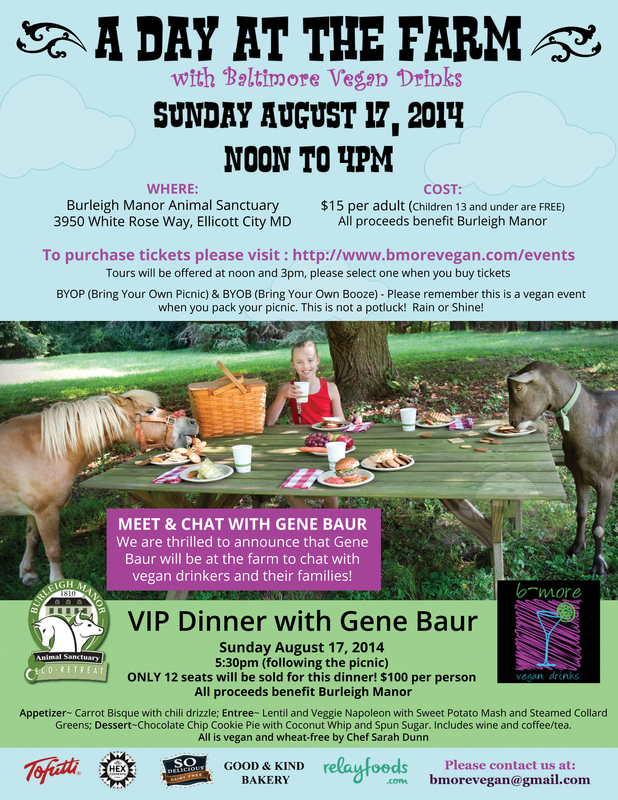 Can’t make it to the farm but still want to help the mission of Farm Sanctuary? You can adopt an animal, buy shirts and gifts online, or just donate funds. Entertaining in style can be simple. Really. 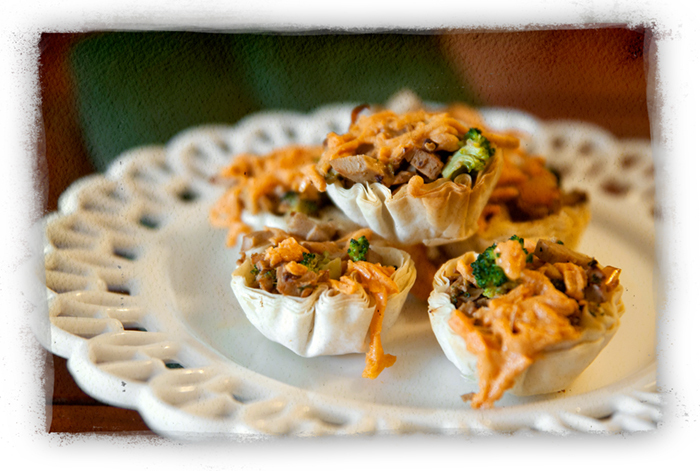 All you need is some Beyond Meat and phyllo pastry shells. Most major grocers carry phyllo pastry shells and we have yet to find any that were non-vegan. This recipe is perfect for serving to company as an appetizer. It’s easier to make than it tastes and comes together in less than 15 minutes. No joke! We like it best with Beyond Meat chicken-less strips, however, it also works with their beefless crumbles, too. So call the neighbors, get some wine and decide on a main course. It’s time to get out the good dishes, because we’ve got the appetizer all figured out for you! Preheat oven to 400. On a baking sheet, arrange 12 mini phyllo pastry shells. Set aside. In a large saute pan over medium-high heat, combine olive oil, Beyond Meat pieces, diced broccoli, diced peppers, garlic powder, onion powder, and red pepper flakes. Saute until veggies are lightly browned and Beyond Meat is warmed, about 5 to 7 minutes. Remove from heat and stir in lemon zest and vegan mayo. Spoon the Beyond Meat and veggie mixture into the 12 phyllo pastry shells. Top liberally with vegan cheddar shreds and place in the oven. Bake 10 to 15 minutes, until phyllo shells are lightly browned and cheddar shreds are soft and melty. This serves four people – three appetizers each. Or one Dirty Hippie, ‘cuz he can eat a dozen by himself! If you are feeding a crowd, get a few boxes of phyllo shells and double or triple the recipe. Note: In the interest of full disclosure, the Dirty Hippie won a Twitter contest where he was awarded a FREE year’s supply of Beyond Meat. We LOVE LOVE LOVE the product, which is why we post recipes featuring it so often. They didn’t give us the freebies because we’re bloggers though, and we’re not on their payroll – we won the food, fair and square. We just wanted you to know. 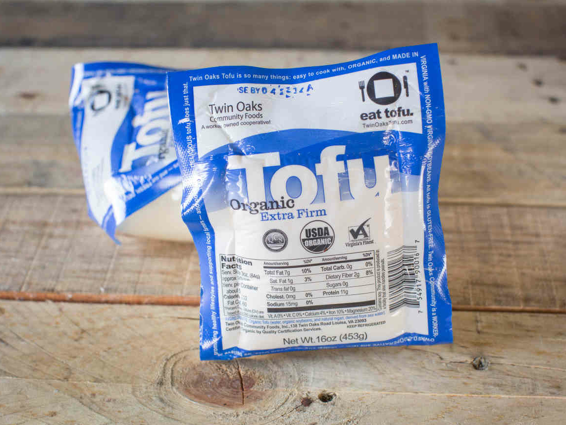 Trying to find Beyond Meat? Use this guide to find one near you! 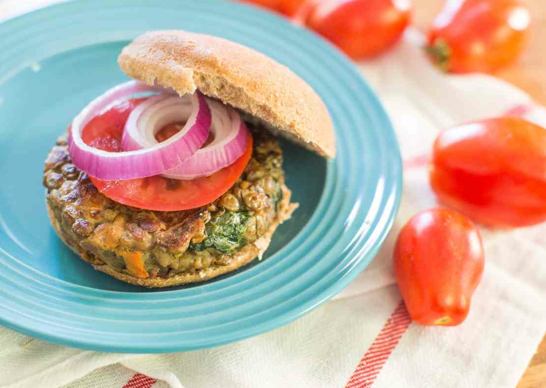 Try Beyond Meat yourself – use this link for a $1-off coupon!